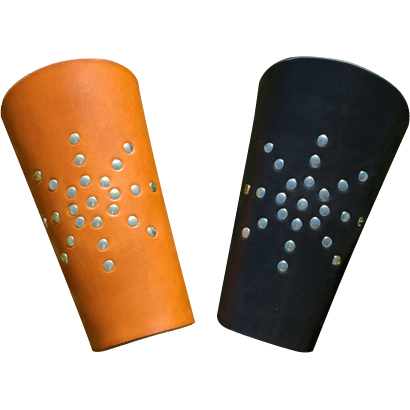 Our Sunburst Leather Arm Bracers have a flattering shape and featuring a studded sunburst pattern in the center. Made of 13/15 oz. armour grade leather, these are suitable for use in the SCA. These bracers lace up in the back. They are available in black, brown, dragons blood red, forest green or midnight blue. Hardware color choices are silver (steel) or gold (brass).